Fall in love with these elegant beauties with their airy sprays of blossom. 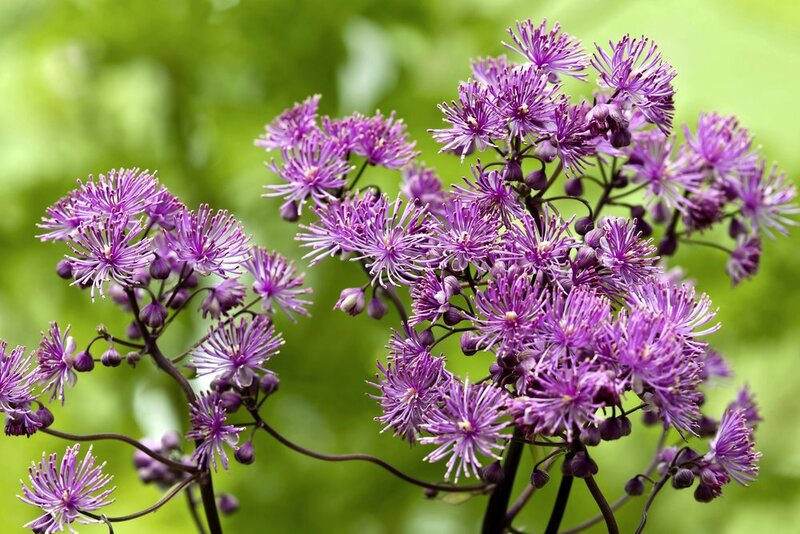 There are few plants that provide a seasonal haze of colour better than thalictrum. At their best their airy sprays or blobs of fluffy blossom on erect stems hang in the air like delicate pastel-coloured clouds. Generally known as meadow-rue, thalictrum are herbaceous perennials and a rather surprising member of the buttercup family Ranunculaceae. While individual flowers are small, and either petal-less, or with petal-like sepals, it is the fluffy mass of male stamens that enchant us in tones of white, through cream to yellow, or from pale to deep purple-pink. Stems vary in length from 60-275cm (2-9ft) in the tallest varieties. The attractive foliage is variously divided into rounded leaflets, often delicate in appearance in smaller species and varieties and varying in tone from bright green to glaucous blue. All thalictrums are hardy as they mainly come from temperate parts of the world, including northern USA, Europe, including the UK into China and Japan. They prefer damp, but well-drained soils in dappled light or shaded situations, although blue-leaved forms such as T. flavum glaucum will tolerate drier soil and sun as long as they get moisture in spring when starting into growth. While the latter types are fairly quick to establish, others take more time to develop sufficient rootstock to create the airy displays we all crave, especially if the soil dries in summer. Ensuring the soil is rich in organic matter will certainly help. Once in flower thin-stemmed types may need staking to help hold them in position. They are quite at home in cottage garden plantings and associate well with airy-flowered ornamental grasses.